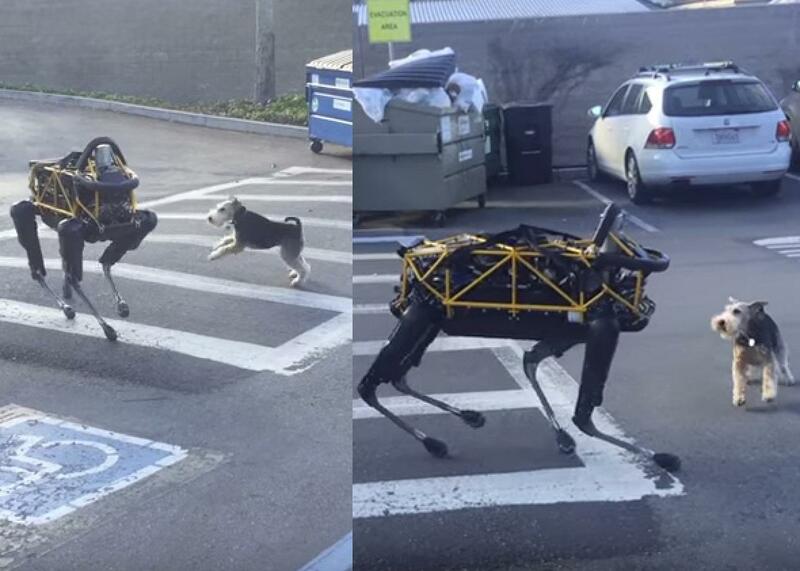 Boston Dynamics Spot robot meets actual dog. Dog videos are standard fare on the Internet, but this video has a twist. One of the dogs isn’t what it seems. OK, yeah, it’s pretty obvious that Spot is a robot, but you have to admit that it’s pretty great-looking. And watching Spot play with a real dog is the best thing you could do on a Wednesday afternoon. Spot is Boston Dynamics’ quadruped robot, built for navigating uneven terrain. At 160 pounds, Spot is more agile than its friend BigDog, but it’s apparently not enough to impress a biological dog. Over the weekend, venture capitalist Steve Jurvetson shot this video of actual dog Cosmo playing with Spot. Cosmo is Andy Rubin’s dog. The co-founder of Android, Rubin managed Google’s robotics division, which acquired Boston Dynamics in 2013, before starting an incubator called Playground Global. Rubin may sound pretty successful, but as IEEE Spectrum points out, Cosmo is even more famous. Cosmo knows an imposter when he sees one, and no matter how much fancy footwork Spot does, it can’t win Cosmo over. But Jurvetson explained the animosity perfectly when he reminded Spectrum about the “un-canine valley.” Well done, everyone.